One Year Later- Let's Celebrate! Can you believe it's been one year?? One year ago today we launched Nickel and Suede and what a year it's has been. What started as a side interest for me has bloomed into a business that supports our family. Last July I posted a little about our crazy and exciting launch day. Who could have know then what that sequence of events would start?! I've loved (almost) every crazy minute of this last year. From Soren and I learning to work together from home and pushing everyday to make our products even better to building a brand and relationships with so many amazing customers. We've sold over 10,000 pairs of leather earrings since we launched our site and have loved being a part of so many women's lives. Thank you, thank you, thank you for sharing us, supporting us, putting up with changes this last year and for cheering us on. 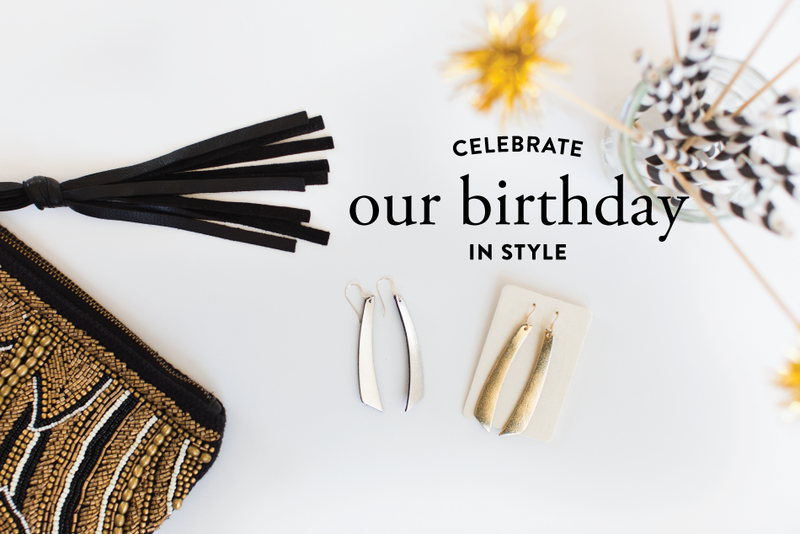 We can't think of a better way to celebrate our ONE YEAR ANNIVERSARY than with a new earring style!!?? Introducing the Accent Leather Earring. This gorgeous new shape comes in N&S Signature Silver and Signature Gold and in two sizes: medium and large. This lightweight leather earring has been in the works for some time now and we've worked hard to get it PERFECT. You will simply adore dressing it up or down. A year ago we launched with a $25 N&S credit giveaway- and let's just say we can do you one better today. We are giving away a $300 credit to Nickel and Suede to buy all of the leather earrings, leather cuffs and other Nickel & Suede accessories on your wishlist. OLM is has awesome style and N&S is sophisticated without having to try. Its ease and just goes with any style! I'm in love with the new earring style! They will be tremendously easy to dress up or down, so I could see them becoming an everyday earring for work *and* just lounging at home. LOVE! I love that this jewelry is so versatile! Happy Birthday!!! I love your earrings. I was never a big earring person but, after seeing so many cute outfits with your earrings on IG last summer, I ordered a pair and haven't looked back. I get so many complements on them and your customer service is amazing! I just ordered 3 pairs and am SO excited to try them out! Love OLM's style and relatability. Love the beauty of simplicity in N&S creations. Love N&S earrings, I wear them everyday and get lots of compliments! I love the high quality craftsmanship of your beautiful earrings. I always love that you have turned a hobby into a family business. Congratulations! Your earrings are my fav! I always get compliments when I wear them and they are so light and comfortable and stylish! Congrats on the one year and keep up the great work. I love supporting family companies and I wish you much continued success! Congratulations on your first year....many more to come! LOVE the new design. Can't wait to try them out! I love OLM style and N&S earrings are the best accessory to any outfit dressy or casual! Congrats! Still love your earrings and cuffs! You're proof of what hard work, preserverance and faith can do! I love how cute they are - haven't had the chance to buy any yet, but have been admiring them for a long time! I really like how wearable the earrings are... As an art teacher I never realized how important comfortable jewelry can be! Kilee I love to see how you style new trients! And your earrings are so stylish and versatile! Happy Birthday!!! I wish you the best in years to come!!! Congrats!! I love the blog and I love following N&S! Your business story is so inspiring- it's amazing what a little idea, dream, faith, and hard-work can create! Your earrings are great quality and so comfortable. Happy Birthday N&S! Happy Birthday! I love following the blog and just love the business itself. So many great pieces at such reasonable prices makes it fun to shop. Wish you many many more years of success! OLM has a great sense of style that I appreciate as another mom of 4 littles! Happy birthday! I love your style and it's awesome to hear you've had a successful year. I love your hair, I love your sense of style and last I love all Nickle & Suede jewelry!! Happy Birthday! My favorite thing about N&S is that all the pieces are simple and classic. Nothing is too over the top, but each piece makes a statement. I love the comfort and beauty of your products. They look wonderful on everyone! I love how your style is trendy but classic and comfortable. Love so many of the pieces offered by N&S! The new designs look awesome! Happy Birthday N&S! Happy Birthday N & S! I love your style OLM, I love your hair and especially your open honesty. I have 6 pairs of N & S earrings and cannot wait to get more :) Thank you! I love your style and your hair! Love all my n & s earrings and they make a perfect gift too! Can't wait to try the new style! Congratulation and Happy Birthday! Love my tan leather cutouts and look forward to getting another pair. I can't wait to try your new fringe cuffs! I am so proud of what you've been able to accomplish, Kilee! Just this month, I gave away all of my "other" earrings - and exclusively wear N&S. You just can't beat the comfort, style, and versatility of them. I will continue to support! I have a pair of your earrings and I absolutely love them. They dress up my outfits so effortlessly. I'm loving the earrings and have been dying to have some! Congrats!! LOVE your earrings and I am so proud of you!!! I love your makeup fashion posts! Love, love, love your practical style and the new earrings! Happy one year! OLM has the greatest style! You look great in everything and you are super relate-able. Happy Birthday N&S! Congratulations! I love that you can dress the earrings up or down. What a fun giveaway. Your earings are so cute! Good luck in your next year! Happy Birthday! I love reading your blog- there is so much variety and you're open and honest! Makes me realize I can be stylish while being a Mama to toddlers and a new born! Thanks for starting your fun business and sharing quality accessories with the rest of us! I can't wait to order some new colors!! Love the new earring style! I seriously do dig your personal style. So chic but comfortable. And I wear my London Tan cuff all the time! you have great style and love your products!! 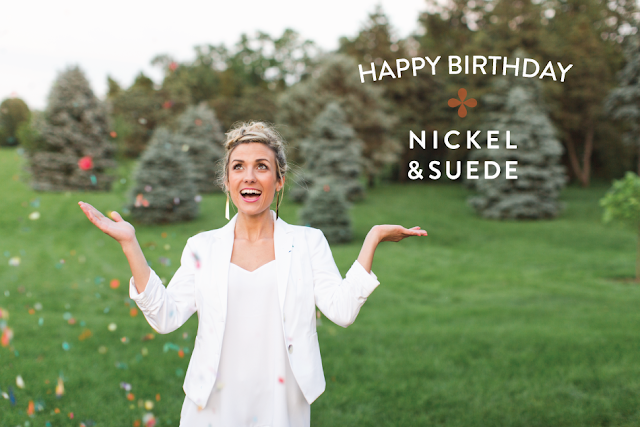 Happy Birthday, Nickel and Suede! I actually just got my first pair of leather earrings for my birthday and wear them all the time! The new shape is amazing! So excited to buy some. love my N&S earrings and cuff!! Happy Birthday N&S!!! OLM you are too cute!!! I would love some new jewelry! I love the earrings, they are so lightweight and there are so many great colors to choose from! I absolutely love all of nickel and suede's jewelry! I'm hooked and gradually getting all of my friends hooked! Happy Birthday! I love nickel and suede earrings...I have 4 pairs, and now I will have to get some of the new style. Very exciting! I wear Nickel & Suede every day! I love big earrings but hate how heavy they are! Lightweight and stylish, they are so perfect! What an amazing giveaway! Happy Birthday!!! I am so excited that your business has grown and is doing so well. I only wear Nickel and Suede earrings and love them. I am so excited for your new earrings, I absolutely them! Can't wait to add more to my collection this weekend. The hard part is deciding what colors to add! The new style is beautiful!! Love OLM blog! Style on a budget! You are my kind of gal!💜Just ordered my first pair of N&S earrings tonight! I love your the fresh look of the olm website and your style! The N&S earrings are so fashionable and the colors you pick are awesome! I love the large leather earrings at Nickel and Suede! I'm obsessed! I love your earrings! Fun and funky yet simple and classic!! I love how real you are on the blog. Beautiful new earrings! Congrats on an amazing first year! I love your hair and style and I love how lightweight the N&S earrings are. I love your outfit posts and favorite products posts on OLM and I love the simplicity of the N&S style. It's really something everyone can wear. Congrats! Love thew new earring!!! Happy Birthday! I love the earrings...I only have 4 pairs so ill have to order some of the new ones! I Love your line! Been following and purchasing for myself and as gifts il since the beginning, can't wait to see what you design in future! Hoping someday you add necklaces to the mix but for now I love my cuffs and earrings! your super cute family and style! I love OLM Everyday Style posts and every N&S earring and bracelet I see! love that the leather can be dressed up or casual - thanks! I love the OLM beauty tips/products to try. Suggestions on clothes and ways to style them. LOVE the thrifting shopping trips you share. I love N&S cuffs. I really need to put these at the top of my wish list with my hubby! Congrats on hitting a year. I love how lightweight your earrings are and that no matter your style...they work! Happy birthday! Love your earrings, and appreciate the chance to win! I love all the cuffs... keep em coming!! Congratulations on all your success! I LOVE the cuffs & rings! Absolutely love N&S and sharing with friends and family. I have QUITE the collection and I will be back for more! Love your brand and love what you stand for! I love that this is a home based business, started with a dream and it's happening. So thrilled for you. Great products as well! Love your stuff! So cute and so nice you get to do it with your husband. Congrats on 1 year!! Btw I have 4 boys-can't wait to hear what you're having!! I love it all- *wearing* your earrings, your cuffs, your style, your posts-you're so real. Can't wait to see what else you have coming! Love the earrings - beautiful and so fun! Love the style and the price! Happy birthday! I love these earrings! They are so stylish and have such a variety of colors and textures to match any outfit! Congrats on a phenomenal first year! I love big earrings, but hate the weight. Your earrings are the answer to my prayers!! And I just ordered my first fringe cuff...can't wait to rock that, too! I love that olm styles affordable clothing! I could pick out outfits all day if I had no budget, but her picks makes everday style attainable! I love love love that about kilee! I started following OLM for Kilee's gorgeous hair but I have come to love the real posts, the great style and gorgeous leather accessories! I love the open and honest posts, the realistic and gorgeous style and beautiful jewelry! Love the new style! The teardrop were a little big for me, but these are perfect! Love your earrings and love the new style! I just bought my first pair of N&S! Love the new style! Bought both colors. Love how light the earrings are. Just bought my first pair! Can't wait to order some more beauties! Love, love, love my N&S earrings! I love your earrings - so fun!! Happy birthday! Can't wait to make my first purchase!